These were some of the topics discussed by banks, investors, lawyers, issuers and financial advisors at a seminar recently organised by AFME (Association of Financial Markets in Europe) at BBVA’s premises in Madrid. The seminar provided an opportunity for market participants to come together and better understand issues related to high-yield bond issuance in Europe. High yield bond is a high paying bond with a lower credit rating than investment-grade corporate bonds, Treasury bonds and municipal bonds. Because of the higher risk of default, these bonds pay a higher yield than investment grade bonds. Based on the two main credit rating agencies, high-yield bonds carry a rating below ‘BBB’ from S&P, and below ‘Baa’ from Moody’s. Bonds issued by companies with ratings at or above these levels are considered investment grade. Over the past two decades European high yield market has matured into a large, stable source of funding. In particular, Spanish companies have become more active in the last 5 years, not only with respect to issuing high-yield bonds, but with respect to corporate bonds in general. The Spanish high-yield market really came to prominence post-financial crisis and after the collapse of the securitisation market. Until this point, thousands of Spanish companies had been benefiting from cheap bank funding. But with lending constraints and other factors resulting in banks shrinking their balance-sheets, companies began looking for new sources of financing to restructure their debt, expand or for other general corporate purposes. As a result, European banks began embracing high-yield bonds and issuance grew from EUR 44.6 billion a year to almost EUR 100 billion today (source: AFME). The principal force behind the increasing relative size of the high-yield bond market was a process known as disintermediation. Disintermediation is where businesses in need of funding bypass bank lending and go directly to the capital markets. While the bank to bond shift is now well-established, there is still work to do for Spain to catch up with more sophisticated markets such as the UK, Germany and Italy. 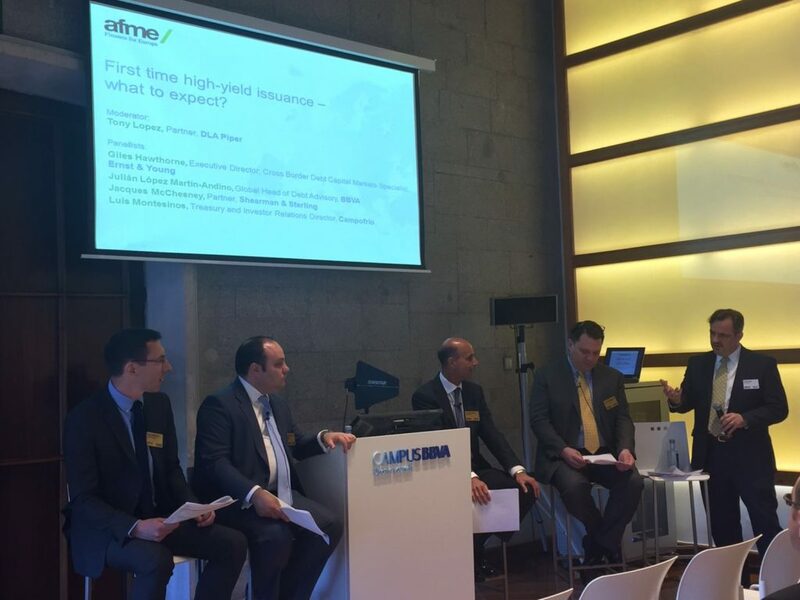 Gary Simmons, AFME’s High Yield Managing Director and Christian Knitzschke, Head of High Yield Syndicate Europe at BBVA provide the key takeaways from AFME’s “European High Yield: Spanish Perspective” conference in Madrid. More recently, high-yield issuance volumes have been negatively affected by external factors driving volatility, such as China’s economic slowdown, volatile energy and base metal prices and their impact on equity markets, as well as macroeconomic policy events. Fortunately, fresh stimulus measures announced by the European Central Bank and other factors have resulted in an improvement in conditions for the European high yield market. Bond issuance has some clear advantages over bank funding, such as greater flexibility, longer terms (up to 10 years and even 15 in some cases), and lower collateral requirements. In 2016 we are likely to see more issuers come to market, lower default rates, and a race for yield.